It's official: Saturday the 13th is the first Saturday the Butler Wobble meets at the Butler Y. 4:30-6:30pm. Free to all. Sign a waiver, wear a helmet (under 18 needs a parent's signature). We have some extra unis (for learners). If the weather outside is frightful (or even if it's not), come and join us. It will be at least 68 deg F and well lighted in the gym. If you're interested in learning- now is the time. We've got at least 3 local events in the works for 2011. Don't miss out! If you've got some flatland or freestyle moves, show us what you've got. We'd love to learn. To some reading this you may be currently experiencing Deja vu (Sorry-I have no idea how to get the special characters). 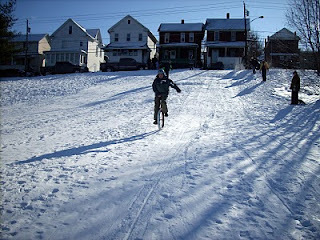 This is another reminder that July 17-18 we're hosting a stage race here in Butler, PA. www.butlerstagerace.blogspot.com is the site for most of the details with unicycle specific info showing up at www.butlerwobble.blogspot.com . Unicycle racing isn't that common on this coast. 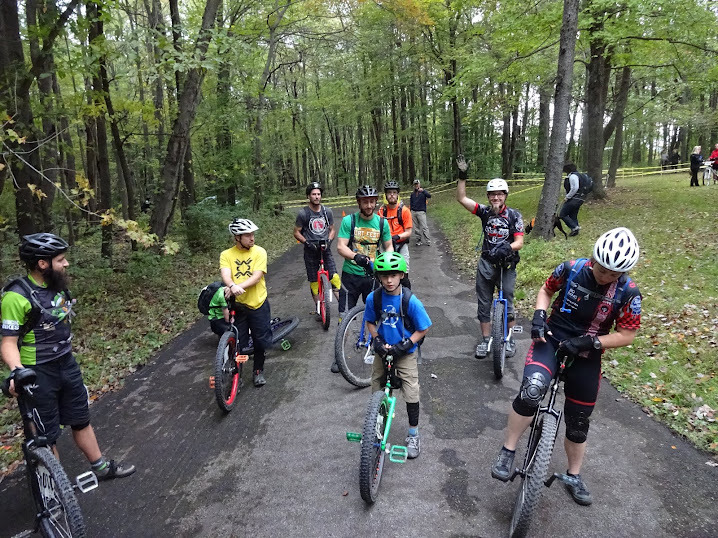 We have a very unique opportunity here to have some fun and show bicyclists and unicyclists aren't just about a circus sideshow- NOT THAT THERE'S ANYTHING WRONG WITH THAT! Personally, I can't juggle and haven't found the time to learn. It's cool if people are into that, but the range of what unicyclists can do is rapidly expanding. I just watched a 26" street video on unicyclist.com. Amazing. I probably won't ever be able to ride like that, but that doesn't stop me from building some uni trials stuff at the local skatepark (right now about 15 pallets and some 2x4s screwed together) because I'm hoping someone around here is going to get into unicycling and will need support. I'm personally not big into freestyle, but we have gym time throughout the winter that a few of you have made it out to. I'll try both disciplines, but they're not entirely my cup of coffee (I'm not that much of a tea drinker). 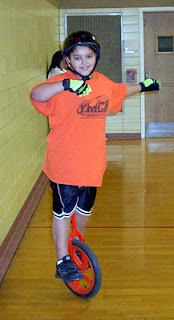 The point is: all of unicycling needs our support. Check out the sites. We've been given a TREMENDOUS opportunity here to engage the cycling public and the general public. Unfortunately, I honestly don't think people understand the potential. The response I've had from emails and unicyclist.com posts I've received has been lackluster at best. We essentially get the same elite amateur courses the bicyclists get for next to nothing. It costs THOUSANDS of dollars to put on this event and we're getting in for almost free. Why would we be invited in the first place? A large uni showing looks good for the event. It is critical that we have a LARGE turnout on the 17th. There are 2 options for the weekend. One is for (essentially) 36ers and Schlumpfs to do all 3 races. The reasons we have to limit are the Time Trial and the Road Race. We are able to use these courses, but they come at a price. 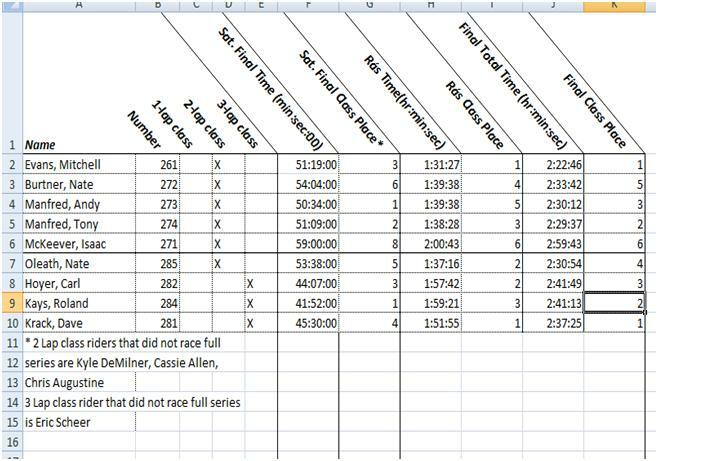 We only get enough time to get about 30 unis on the TT with the last rider getting 45min to complete the 6.5 mile mostly flat course. We have to essentially be done before the bikes (which can be going 30mph) have to worry about us being a bit in the way. The road race is a logistical nightmare integrating with the bikes. We get 3 hours at the maximum on the course. 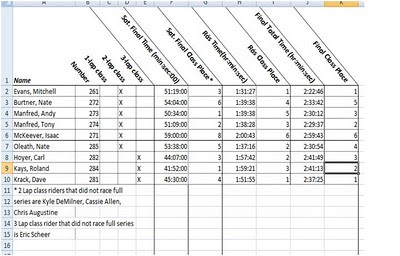 I rode 3 laps in 2:00:56 a few weeks ago so it shouldn't be a problem, but we have to plan for everything. Option 2 is the Crit only. This event is for EVERYONE who can ride a uni. We'll be on a downtown closed course with a pile of non-unicyclists who are out to see the race. This race should be a ton of fun. Honestly, it's as much about the public exposure as it is the ride itself. Anyone who gets this email should at least consider this. We're charging a whopping $5 entry fee (we need to contribute some money towards the event). We'll even have some prizes. We're just under 3 weeks away and I've only got about a dozen riders who have committed to the race. If you have a 36er (or possibly a 29er) and think you could do a 10k in 45ish minutes we would like to have you here. An option to consider might be to sign up for the 3 race series and then only do the first day's 2 races and skip the second day. In the grand scheme of racing, a $30 entry fee for 2 races is REALLY cheap. Ideally I'd like to have a full field for the 2 days, but I may have to realistically accept the fact that people don't want to race on a difficult open road course. If you do decide on doing both days, there are options for 1,2,or 3 laps. I haven't seen much interest in the 1-lap option yet, but it will be there in case it's needed. I'm finalizing prizes and swag with some sponsors and I'll get those details once the boxes arrive. In the interest of keeping entry fees low, I didn't put a lot of our entry money towards just the top people winning lots of money. I'm going as deep as I can and sharing the wealth. If you're not going to U Games, you need to be here on July 17th (and hopefully the 18th). We need a strong showing in the number of unicyclists for the first year of this soon to be annual event or we may not have this opportunity next year. Please email me if you will be coming or you have further questions that www.butlerwobble.blogspot.com or www.butlercountystagerace.blogspot.com don't answer. I can't stress enough how generous the promoters have been to include unicycles in this event. We need to return on their investment. Oh yeah, you'll need to be a USA member to participate. You can join at registration (it's only $20, but it gets us insurance coverage and you get a whole lot more!). Also: Helmets and gloves (or wristguards) are necessary. Kneepads are highly encouraged. July is Unicycle (and Bicycle) Month in Butler! For the past several months we have been meeting the first and third Fridays for a 45-60min road ride on the downtown proposed cycling routes. Each ride we've had at least one Butler Wobble member on a uni. Not bad stats considering how many unicyclists there are in the area when compared to bicyclists. Anyways, the discussion came up about what to do with July since the first weekend is considered a holiday weekend (although not in Great Britain). There was a proposal to move the Fridays to the 2nd and 4th. There was then the genius idea of riding every Friday and delcaring it "Bicycle Month in Butler" since we've got the stage race coming the 17th and 18th. 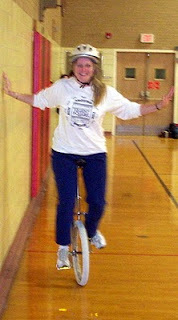 Well, we here at the Butler Wobble HQ like the idea, but we're going "one" better and adding it is also Unicycle Month in Butler. The long and short of it: If you pedal, join us for fun no-drop casual rides every Friday at 6pm. We're meeting in the parking lot across from the Burger Hut downtown. Afterwards a group of us usually heads someplace local to eat. Stage race tie in: Friday the 16th will be a preview of most of the tt and crit courses (with the addition of autos on the 16th). Non-Butlerites take note. One last note: if you plan on joining us on a uni we'd recommend a 26" or larger wheel or really short cranks on a 24. 125s on a 26 has worked ok for Andy so far, but he's an animal. It's do-able otherwise, but could amount to a long ride for a small wheel! BCSR- please be sure to check the official site for start times and course details. Since we're using the same courses as the bikes most of the data is pertinent. Also, prizes are being secured and we're working on getting some swag for all registrants with the nod going towards the 3 race riders. On that note: there seems to have been a bit of confusion of what people can race. The simplified version is: unlimited class- over 16yrs old AND greater than a 29" wheel (a 29er may be ok, but you'll have to contact us personally). On the 17th there will be a "B" crit where we want EVERYONE who can ride a uni to ride in it. This is the chance to put on a show for the spectators who are there to watch the bikes and unis. Helmets are NOT optional. They are mandatory. Wed Wobble Meeting at the skatepark (6/23) is cancelled this week due to the skatepark being closed for the week. BCSR is just over a month away! I just noticed it's been a while since things have been updated. That doesn't mean we've forgotten, it's just things have been busy with logistics that aren't that fun to report. If you're planning on racing, we'd like to know. We've got spots for about 30 riders (36er or Schlumpf) for the 2 day series. We have at least a dozen who are "definitely maybe" or above. We can't go much more than 30 due to time trial logistics. Things will really take off next week. Check out the BCSR blog! We've got logistics settled so that unis go out for the TT one at a time. Two crits A and B. The A race is for those signed up for all 3 events. Wheel size will be limited to 700c and above. The B race will be for anyone who can ride! The max wheel size is 29in for this event. There will be minimal prizes for the B race (probably just ribbons), but it will be only $5 to enter! We want EVERYONE who can ride a uni in on this for the spectators' sake. It looks like we can set registration for the 3 race weekend at $30! Since it's the inaugural event we want to keep the price low to encourage people to make the trip. The prize list won't be nearly that of the bikes, but the fun factor will be at least as good. Once again EVERYONE who rides MUST be a USA member. It's only $20 for the whole year! The Butler County Stage Race details are coming together one step at a time. Being that this is the first year for the event, there are a lot of logistics to be worked out. Next year will be much easier, but don't wait until then! A lot of my time so far has been involved in getting the web end of the bicycle race together along with getting the actual time frames for the unis worked out. Our tenative plan is to have the unis go off first both days as we will most likely be the smallest of the categories. The road race day will have 3 options: 1,2,or 3 laps. I was originally thinking only 1 or 3 to keep things simple, but after holding some discussions we decided there needs to be the 2 lap option. 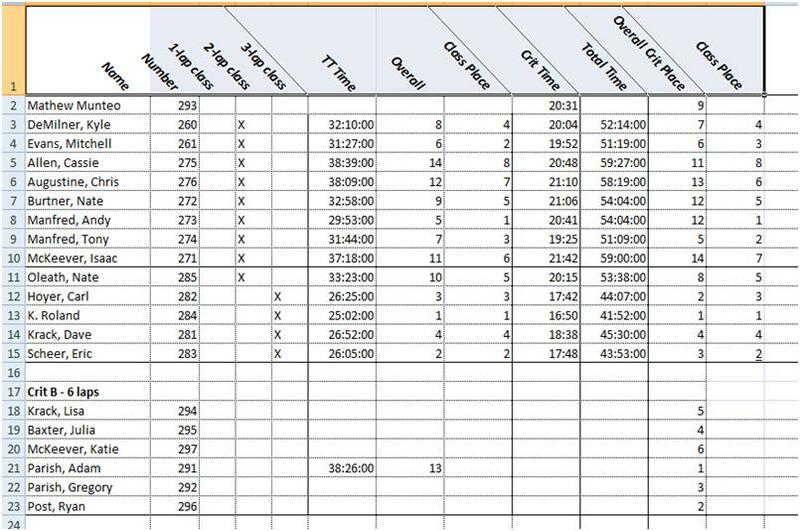 There will most likely be a 2 hour cutoff for 2 laps for those taking the three lap option. After preriding the course last weekend I found a lap to take somewhere in the neighborhood of 45-50 min for me (ungeared 36 with 110 cranks). The main part of the steep hill took me right around 5 min to climb on the 2nd full trip up. The Time Trial is pretty straight forward. We're still getting logistics worked out, but we may need to send out riders 2 at a time with 30 second intervals between. We want everyone who can ride a unicycle involved in the Criterium. 2 heats. One will be for the big wheels and/or geared, one for more of the novice crowd and anyone who can ride. I'm still trying to figure out how many laps or what length of time to make the heats to fit the schedule. We're in the planning stages for a Saturday night dinner/ party for the unicyclists. We've got a fantastic chef committed to helping us pull it off and now we'll work on a venue. We don't have a motel list yet, but we do have some who are willing to play host families for the weekend. There are local motels, but it's best for us to wait just a bit to get the bicyclists in on the group rates too. I know some who have done racing before have expressed concerned about geared/ ungeared. The current plan is to have overall rankings and ungeared recognition as well. How deep things will go depends on how many people show up for the weekend. We don't have any online registration up. We haven't completely finalized costs so we don't have a definite registration fee schedule either. 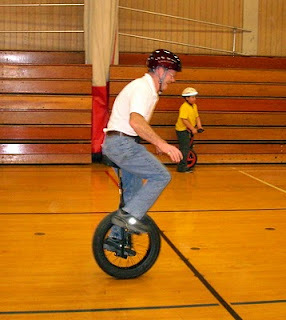 Being that we'll be under Unicycling Society of America insurance will allow us to keep the registration fees under $50 for the weekend. How much lower we can go I don't know yet. If you are seriously looking to attend, please shoot me an email at dave(dot)bikes(at)yahoo(dot)com. Replace the () with the symbols. The more data I have now, the more answers I can have soon. Quick exciting update: Last weekend we had a muni ride with 4 people from the really local area. Isaac, Nate, Andy and I had a great ride on Saturday before the YMCA time. The Butler Wobble is heading outdoors. For me it was almost great- #2 of 2 Gazzaloddis decided to not play nicely with the Large Marge on the Conundrum. This left me with not only a lonely walk home, but it left me out of the downhill where Isaac attempted to fly. Unfortunately he didn't miss the ground. Fortunately he wasn't hurt. We'll be adding more to the tribe when Tony's wrist heals. We've had a great run of unusual weather around here. March usually isn't in the high 50's or low 60's and sunny. Now that the snow is gone (it went from unrideably deep to non-existent in less than a week) we've been heading outside more and more. Pockets of unicyclists have been springing up around town. That's good. Since we're unsure how long this weather is going to last, we're still maintaining Saturdays at the YMCA until probably the end of April. While it's tough to head indoors when the weather's so beautiful it does have its advantages. Flat surfaces lined with walls and bleachers are ideal for learning to ride. Our trend of having new riders each week continues. Last time I checked our YMCA roster was around 30 or so. That's fantastic. The list of people who can check of the "Can ride a unicycle" box on a job application is expanding. Recently we've added Ben, Kelly, Brett, Adam (#2), Matt, Dan (thanks to Lisa for bringing the last 3), and Bruce. Bruce is amazing. He's definitely the most "Experienced" of the lot- as in he's taken the most laps around the sun. You can ask him how many when you meet him. He's the guy in Butler on one wheel. Oh wait, that could be any number of people. There's a part of me that is a bit bummed about skipping out on the Pittsburgh St. Partrick's Day Parade tomorrow. There's a part of me that thinks 45 deg F and rain doesn't sound like much fun in parade mode. 70%+ chance of rain and 18mph winds just don't sound like much fun when you're moving slowly at best. Nate and I are the last 2 standing as Isaac has a case of death (not really, but I'm getting my zombie defense kit in order in case he swings by). We'll be at the Butler YMCA later in the day. Unlike the parade, they have a roof and walls. Sorry Wonders Unicycle Club. Ride on. Unicycle Racing - and Parade? The snow's beginning to melt. Planning is underway. At this point we're still kicking around ideas for unicycle racing classes. EVERYONE should plan on entering the Time Trial and Crit. We're going to accomodate all ages and wheel sizes. 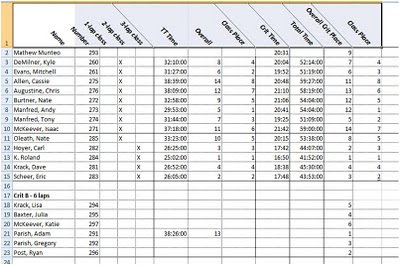 The road race we'll be looking at possibly a 1 lap option for 24-29inch wheel sizes and 2 or 3 lap options for the 29 and above set. We're also considering the geared and ungeared debate. Mid-March is when things really pick up. Don't forget, March 13th we'll be joining The Wonders for the Pittsburgh St. Patrick's Day Parade. We'll have more details soon.